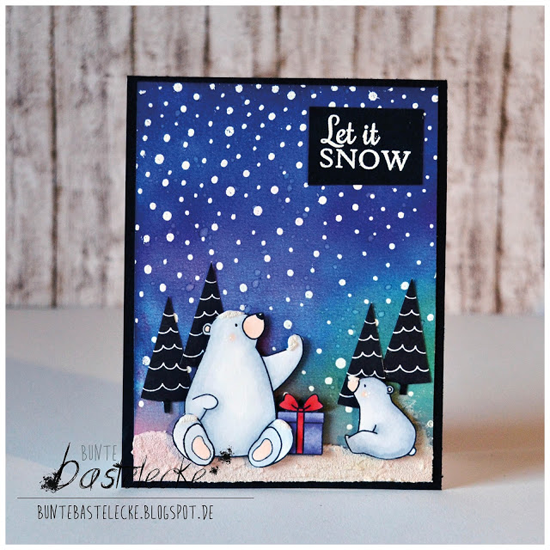 I spotted Wiebke's lovely wintry scene as one of the entries for the Card Design Superstar Contest. I was particularly enchanted by the night sky that she created with our Snowfall Background stamp and the stark black trees silhouetted against the night sky. Our Birthday Bears look rather content to share a peaceful moment together in the great outdoors. So pretty, Wiebke. 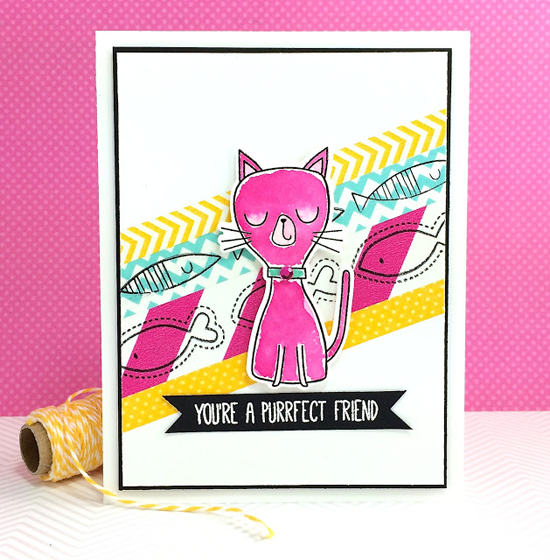 Design Team Member Barbara Anders spotted Lynn's sassy card on her blog. Barbara says, "Lynn rocked Cat-itude!" Indeed, she did! I love these vibrant colors SO much. As Lynn says in her blog post, "... Have you ever looked at a stamp set and really wanted it but didn't necessarily 'need it' but just had to have it?... Well this wonky fun new My Favorite Things Cat-itude stamp set was it. I had to have it! So I told myself... that if I bought this set I would work it and make a bunch of cards with it, and get every stamp in the set inky!" What a great challenge, Lynn! I spotted Ksenia's stunning card on Instagram following #mftstamps. 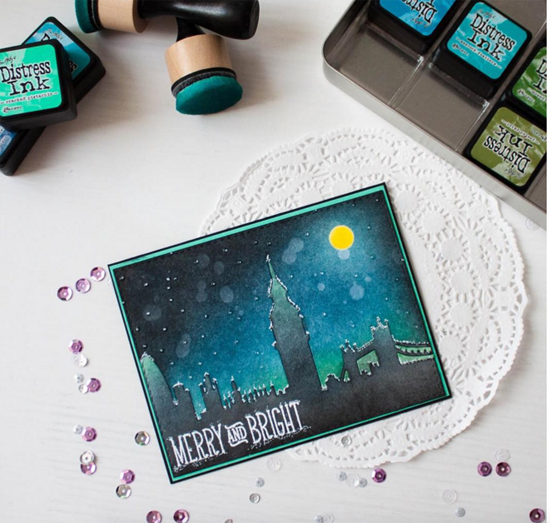 What a gorgeous scene she created with the London Skyline Die-namics! Ksenia made this pretty card for her sister after they had had some adventures in London. Ksenia's photo caption says this, "Hey, Londoners! I hope you'll have a White Christmas this year! My new card is all about that dream!" And what a lovely dream it is! Design Team Member Francine Vuillème spotted Christine's fun card on her blog. 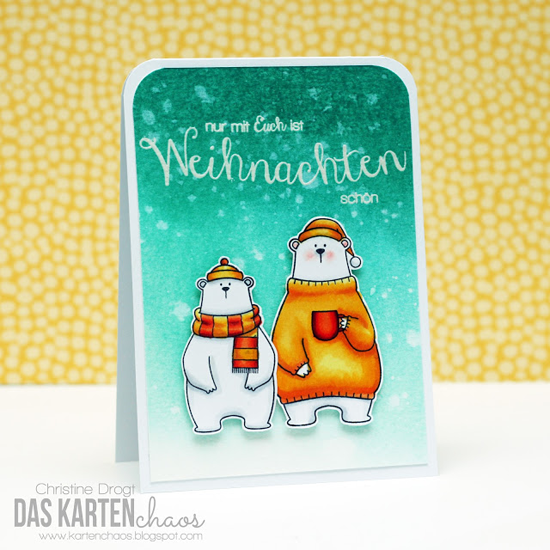 Christine features two cute bears from the Cool Day stamp set on this card with a sentiment that reads like this in English — Christmas is Only Nice with You. How lovely is that? Francine says, "I love the beautiful colors Christine chose for this winter card! The Birdie Brown bears are so bright you'd think they are glowing! This card is luminous!" Sehr hübsch, Christine! I spotted Rachel's card on Instagram following #mftstamps. Now that we've officially made it to December, I'm ready to spend cozy nights in by the fire enjoying the lights and warmth of the Christmas season. And this design certainly sets the mood. 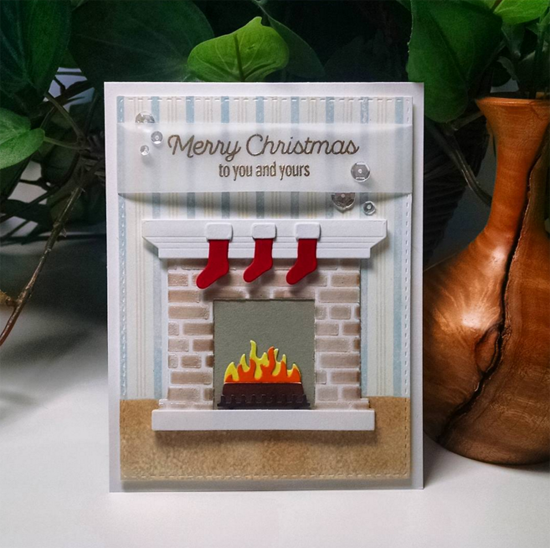 Rachel says, "Just love this Fireplace die from #mftstamps!" And we love what you did with it, Rachel! Thanks for using MFT, ladies! You've left us inspired, and that's what it's all about! 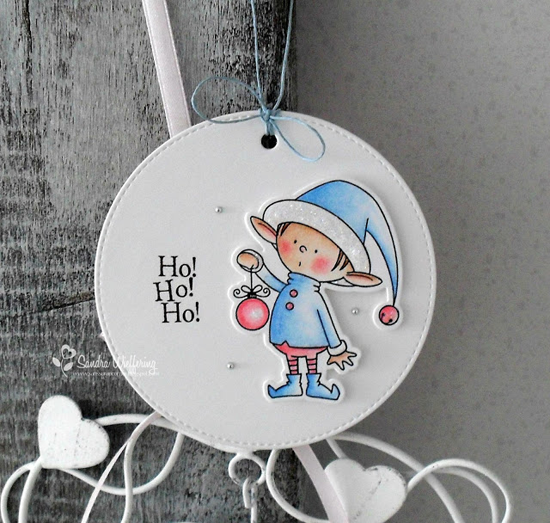 See you tomorrow for the next Sketch Challenge, and look for a new MFT Color Challenge on Thursday, December 10th! How fun! This sure makes me smile! Thanks so much for spotting my card and for the wonderful inspiration of all the other cards posted here. Thank you so much! It is a great surprise for me on the first day of winter! Thanks so much for spotting me! What an awesome way to start my day! Omg! Thank you so much for spotting my card!! :) what an awesome surprise!